A Purdue University-affiliated startup is seeking to open up access to space for microsatellite companies by modernizing a launch technique first used in the 1950s. Leo Aerospace LLC plans to use "rockoons," or high-altitude balloons, that launch rockets into suborbital and orbital flights. Suborbital launches are frequently used by researchers who need access to zero gravity or vacuums for experiment, while orbital flights are used by satellites. 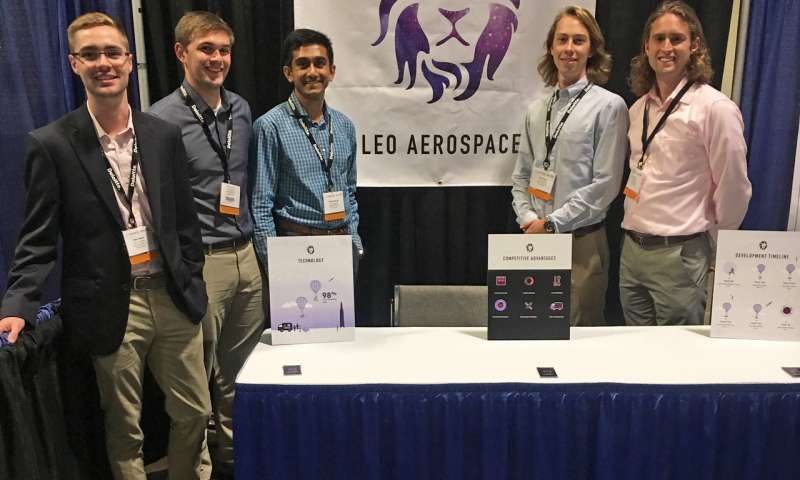 Officials of Leo Aerospace, which took its name from Low Earth Orbit, say the company will revolutionize the space industry by giving priority service to microsatellite developers that now are secondary payloads for large rocket companies. Currently, developers have to wait to see if there is room left on large rockets carrying government payloads and often have to wait six months or more to find space on a rocket, a delay that can be quite costly. Those microsatellite developers also have limited options on which orbit their satellites are delivered to and when they are launched. 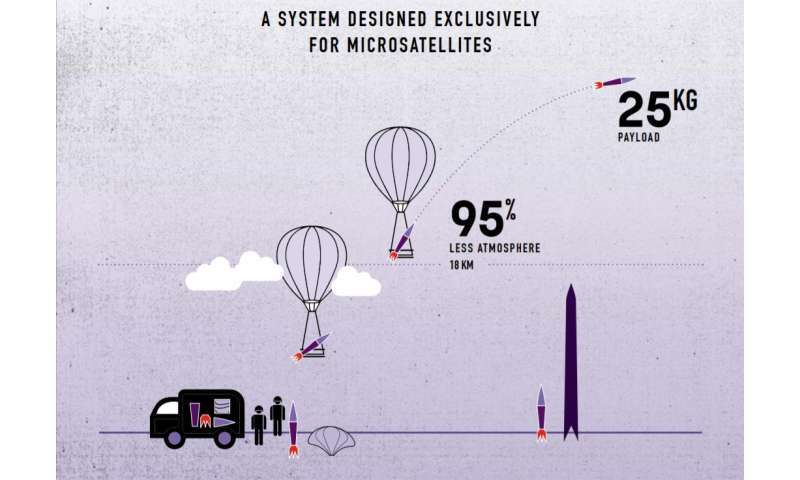 "We're targeting the microsatellites by saying, 'You don't have to ride-share with anyone. We can guarantee you will be our only payload and we will be focused on you,'" said Drew Sherman, Leo Aerospace's head of vehicle development. "'We will work with you exclusively to get you into orbit. You won't have to worry about other payloads or getting dropped off in the wrong spot.'" Abishek Murali, head of mission engineering, said a selling point for Leo Aerospace will be its flexibility and ability to meet customers' needs. The company can tailor its launch vehicles and its operational capabilities to the exact needs of its clients. "Our goal is to give people access to space. The only way to do that right now is to help people get their satellite into orbit. That's where we want to leave our mark," he said. Leo Aerospace plans to harness physics to cut costs and expand mission capabilities. The cost of sending a satellite into space can be up to $60,000 a kilogram. Leo Aerospace is confident it can lower that cost to launch microsatellites, which can weigh 1 to 50 kilograms. The rockoon, a hybrid of a rocket and high-altitude balloon, is less expensive to deploy than a traditional rocket since there is less drag because the rocket isn't launched until the balloon is 11 miles above Earth, where there is 95 percent less atmosphere to cause drag. "By doing that you can scale your rocket down much more efficiently," said Sherman, who is pursuing a master's degree at Purdue in engineering management with an emphasis on propulsion. Leo Aerospace conducted a customer discovery and market validation study through the National Science Foundation I-Corps program and found a large demand to deploy microsatellites. The rockoon was first used by the U.S. Air Force in the 1950s. Leo Aerospace can precisely launch the rocket by controlling the pitch and angle using core integration technology, for which it has filed patents. The company's goal is to launch its first suborbital flight by 2020 and use these funds combined with a series B funding round, to launch its first satellite into orbit in 2022. Its long-term goal is to increase launch frequency as operations develop. The company has done some preliminary analysis work and some hardware testing. Leo Aerospace plans to initially launch the rockoons from existing spaceports licensed by the Federal Aviation Administration. The spaceports stretch from the Kennedy Space Center in Florida to Kodiak Island in Alaska. Leo Aerospace plans to reuse the balloons for future launches, but the rockets will be used only once, said Murali, who is pursuing a graduate degree at Purdue in engineering management with an emphasis on dynamics and control systems. Leo Aerospace is now looking for funding to get off the ground. The company won $15,000 in March through the Burton D. Morgan Business Model Competition. Leo Aerospace already has raised more than $130,000 of its $250,000 goal through Netcapital, a private equity and venture capital firm. People interested in investing can get more information here. The company plans to seek Series A funding in the next two years. The company was started by five then-Purdue students as a club that they then decided to turn into a business, receiving guidance from the Purdue Foundry, an entrepreneurship and commercialization accelerator in Discovery Park's Burton D. Morgan Center for Entrepreneurship at Purdue. The rocket scientists developed their business plan and learned what they needed to do to move forward. "We want to be part of the space market," Murali said. "People are interested in space and creating technologies that not only can operate in space but also help people back on Earth. What we're trying to do is help them get there."